Way to go Team SWEEP! Our MATHCOUNTS team earned first place in the state championships in Richmond this past weekend. This year’s team, dubbed Team SWEEP as a combination of their initials, included: Sam W. ’23, Eleanor K. ’22, Ethan Z. ’23, and Pravalika P. ’22. This marks the BASIS Independent McLean MATHCOUNTS team’s second time participating and second time winning in the annual statewide MATHCOUNTS competition. Both Pravalika and Ethan were on last year’s winning team as well. Team SWEEP is led by Coach Mr. Sullivan and Assistant Coach Dr. Grove, a BIM math and science teacher. The team earned a spot to compete in the State Competition by winning the regional competition in February. In the individual MATHCOUNTS competitions, Pravalika earned first place, while Ethan finished third, and Sam earned fourth place. Fourteen MATHCOUNTS teams were present at the Virginia MATHCOUNTS State Competition and approximately 84 students participated. The Virginia State MATHCOUNTS team heading to the National Competition is composed of the top four state individual winners: Pravalika, Sam, Ethan, and a Mercer Middle School student. The team will be trained by BIM Coach Mr. Sullivan. The National Competition, held in Washington, D.C. from May 12–15, will include 224 middle school competitors and 56 teams from around the United States. A portion of the National MATHCOUNTS Competition will be streamed live on ESPN3. 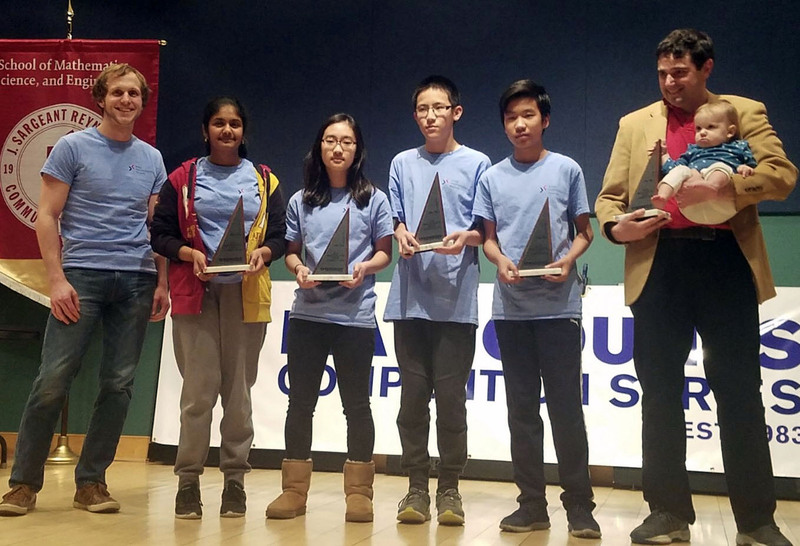 MATHCOUNTS is a national middle school math enrichment program offering competition and club activities designed to foster appreciation of math among U.S. students in order to prepare students for future career opportunities and success. Go Red-Tailed Hawks! We are immensely proud of your hard work, dedication, and triumphant victory! BIG WIN! Mathcounts Team Wins State Championship! !